United States Air Force begins their F-35A Lightning II Operational Utility Evaluation. "The start of the OUE is another huge milestone for the Air Force and the program as a whole," said Col. Andrew Toth, 33rd Fighter Wing commander. "We've been preparing for this event since the arrival of our first aircraft in July last year. So far, the men and women of the 33rd Fighter Wing have proven we can successfully execute safe and effective flying operations in addition to academic training." 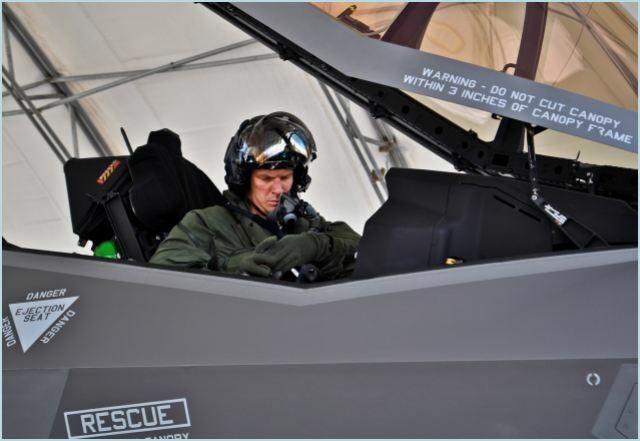 Since February's Military Flight Release, 11 experienced fighter pilots checked out in basic F-35A operations so they can be prepared to be the military's first cadre for the fifth generation fighter. Maj. John Wilson and Maj. Matthew Johnston, the 33rd FW pilots going through the evaluation, are ready to be taken through a rigorous process where data will be collected from all facets of JSF training - maintenance, classroom, simulator and flights. Leaders at the 33rd FW are confident their team of Airmen, Navy, Marines, contracted partners and civilians are ready for the next milestone in the nation's next half-century of airpower dominance. "We are ready for the Air Force Operational Test and Evaluation Center to give us an outside look on the way we conduct our mission," said Toth. "At the conclusion of the evaluation we should receive the Air Education and Training Command's approval that states we are 'ready for training'." wing is responsible for F-35 pilot and maintainer training. Initially, 59 aircraft and three flying squadrons, one for each service/aircraft variant, will be established at Eglin. The 33rd FW has flown more than 200 JSF sorties, both A and B variant, increasing pilot and maintainer familiarity with the aircraft, exercising the logistics infrastructure and continuing to develop aircraft maturity. These initial F-35A flights were limited, scripted and conducted within the restrictions and stipulations made in February's military flight release. Now that release has been updated for OUE, necessary joint program office and AFOTEC formal readiness reviews have been completed and the AETC local area operations metrics and safety reviews all support the Air Force readiness to execute OUE safely and effectively, service officials said.